Le Petit Festival du Théâtre 10 years! Celebrating the new decade, starting from her home town of Dubrovnik, Le Petit Festival is on a European tour. The first stop is idyllic Hanko, Finland’s southernmost city surrounded by the Baltic Sea. Nostalgic Hanko will be coloured with the festival’s various art forms and a carnivalistic atmosphere from 28th to 30th of August 2015. Artists from Finland, France, Croatia, Japan, the United States and the Netherlands will perform in the event. Presentation places of Le Petit Festival are Hanko City Hall Banquet Hall stage, Hanko Casino and the city’s streets, parks and beaches. The festival’s theme is Vive L’Amour, ie Long live love! You are warmly welcomed! The Hanko City Tourist Office is an official partner of WWF’s Operation Mermaid, and Team Hangö is the campaign name of our joint efforts. Operation Mermaid is WWF Finland’s campaign to save the Baltic Sea. It attacks the problems facing the Baltic Sea, such as eutrophication and the risks of oil transport. 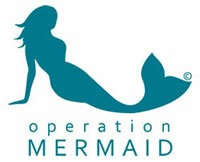 The slogan of Operation Mermaid is ‘Man needs seas, seas need man’.